I've not really posted about blogs before that should change - there are so many great blogs out there! I came across these blogs and just had to share them with you. 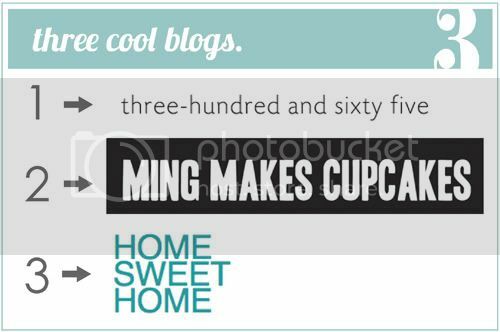 I mean, I think they're pretty cool :) 3 different blogs with only one content: cupcakes, ampersands, and homes. Love it! Hope you enjoy! #1 - ampersand ampersand: Celebrating the beautiful of the ampersand, one new ampersand posted each day. So much lovely design in a symbol. #2 - ming makes cupcakes: The yummiest looking cupcakes with recipes included! I wish I could magically make #2 appear on my desk right now, that one looks delicious. #3 - home sweet home: a blog that posts images of all things related to homes and rooms! What more can a girl ask for? Interesting blogs! The Home Sweet Home one is already on my follow list. I LOVE the one with the cupcakes! Totally going on my favorites list! I agree, I would love have number 2 or 3 or 25 on my desk too...looks yummy!!! Thanks for sharing these inspiring links! I am always on the lookout for inspiring places to visit, and these could be added to the rotation. Great idea to feature blogs that you love just for the sake of loving them. I would say that about your own space! oh my goodness - thank you for sharing that cupcake blog! Wow! Those cupcakes are AWESOME! I've never seen so many different ones... wow wow wow. THey're so beautiful too!